Indigenous Protected Areas recognise Aboriginal people as land owners and managers and supports them to look after biodiversity hotspots and highly sensitive areas they want to see protected. In the Kimberley, there are nine Indigenous Protected Areas, of which four link together to create the largest Indigenous-owned conservation corridor in northern Australia. Indigenous Protected Areas are the preferred land management model in the Kimberley and cover more than 90,000 sq km. This model is supported by the Australian Government and provides a formal structure for recognising Indigenous rights to manage country while promoting biodiversity and conservation outcomes through the National Reserve System. Establishing Indigenous Protected Areas requires Aboriginal communities to develop long-term Healthy Country Plans of management that set out the environmental targets they want to achieve while managing threats to biodiversity health. 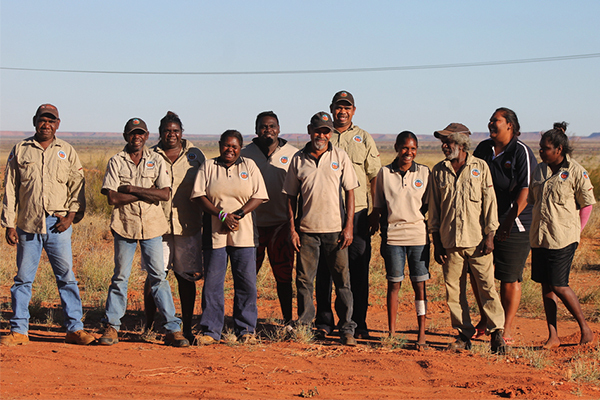 Indigenous ranger groups work to implement the aims and objectives of management plans under the guidance of their cultural advisers who set and review work plans and progress reports. Indigenous Protected Areas provide a feasible and effective way to maintain the ecological integrity of country while fulfilling the need to develop cultural economic enterprises. Some native title groups are using their Indigenous Protected Areas to develop tourism businesses and immersion experiences, undertake environmental management and research contracts and fire management projects. The IPA engagement and management model promotes Indigenous leadership and provides the right match between cultural obligations and environmental responsibilities. The success of the Indigenous Protected Area program can be directly linked to the recognition of Indigenous rights to and management of traditional country. The Paruku IPA was declared in September 2001 and covers 4300 sq km within the Tjurabalan native title area which borders the Great Sandy Desert and Tanami Desert regions of the south Kimberley. The IPA is named after Lake Paruku or Lake Gregory, a significant water source in the arid desert that is recognised as a major migratory stop-over area for a variety of shorebirds. For more information on the Paruku IPA visit the Department of Environment website. The Warlu Jilajaa Jumu IPA was declared on November 9, 2007 and covers a 16,430 sq km area in the Great Sandy Desert, in the north eastern section of Ngurrara country. The IPA’s name comes from the Walmajarri words Warlu, the fire used to keep country healthy, Jila meaning living water, permanent waterholes, and Jumu, seasonal soaks. For more information on the Warlu Jilajaa Jumu IPA visit www.yanunijarra.com or the Department of Environment website. Stage one of the Uunguu IPA was declared on May 23, 2011 across 3435 sq km of country in the far north Kimberley. The IPA’s name – Uunguu – comes from the Wunambal Gaambera word meaning our living home. The Uunguu Indigenous Protected Area is a seperate entity to the KLC. For more information on the Uunguu IPA visit www.wunambalgaambera.org.au or the Department of Environment website. The Bardi Jawi IPA was declared on May 23, 2013 and covers 950 sq km of land and sea country on the Dampier Peninsula. The Bardi Jawi name comes from two language dialects, Bardi from the mainland and Jawi from Iwany (Sunday Island). For more information on the Bardi Jawi IPA visit the Department of Environment website. The Dambimangari Indigenous Protected Area spans 14,000 sqkm of country in the Buccaneer Archipelago. Located within the Dambimangari native title area the IPA includes a long coastline dotted with islands, whale breeding grounds, unique reef systems, cascading waterfalls and rich biodiversity values. The Dambimangari Indigenous Protected Area is a separate entity to the KLC. For more information on the Dambimangari IPA visit www.dambimangari.com.au the Department of Environment website. The Wilinggin Indigenous Protected Area was declared on June 11, 2013 across a 24,174 sq km area along the iconic Gibb River Road in the central north Kimberley. The Ngarinyin people declared the Indigenous Protected Area to reinforce their traditional connection to country which was created by the law of the Wanjina and Wunggurr spirits. For more information on the Wilinggin IPA click visit the Department of Environment website. The Balanggarra Indigenous Protected Areas was declared on August 7, 2013 across 10,000 sq km of country in the remote far north Kimberley. Balanggarra Traditional Owners declared the IPA so they could control of the management of their country to ensure its high biodiversity values would be maintained and enhanced into the future. For more information on the Balanggarra IPA visit the Department of Environment website. The Karajarri IPA was declared on May 7, 2014 across 24,797 sq km of country in the southern Kimberley. Located across the Fraser Downs Pastoral lease and an inland area towards the Great Sandy Desert, the Karajarri Indigenous Protected Area will strengthen Karajarri culture and heritage. The first stage of the Yawuru IPA was declared in February 2017 over 1,279 square kilometres of Yawuru country. The IPA includes parts of the Yawuru Conservation Estate comprising Nagulagun Roebuck Bay Marine Park and the Birragun Coastal Conservation Park. The IPA also includes cultural heritage value areas within the Roebuck Plains cattle station. The Yawuru Indigenous Protected Area is a seperate entity to the KLC.